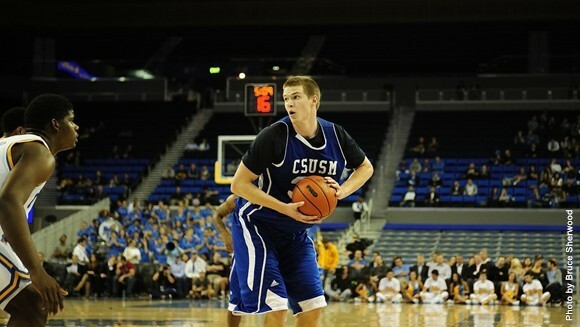 The Cal State San Marcos men’s basketball team is off to an 8-0 start this season. Photo Courtesy of aiisports.com. With the No. 15 team in NCAA Division I in their backyard (SDSU), the Cal State San Marcos men’s basketball is also vying for attention with their 8-0 start to the season, which ranks second best in the National Association of Intercollegiate Athletics (NAIA). Not to mention, San Marcos has also already beaten four teams ranked in the NAIA Preseason Top 25 poll, including No. 1 Vanguard (Calif.) , No. 11 MidAmerica Nazarene (Kan.), No. 18 Lindenwood-Belleville (Ill.) and No. 22 Rocky Mountain (Mont.). CSUSM was ranked No. 3 in the preseason poll. While the NAIA does not present the same competition level as the NCAA, the Cougars are making progress as they are in the process of transitioning into the NCAA Div. II, and also have an on-campus arena set to debut in fall of 2016. Senior guard Blake Nash, who is a transfer from the University of South Florida, has set the tempo for CSUSM, leading the team in points-per-game (25.1) and assists-per-game (4.0). The Cougars mounted a late comeback on Tuesday night to defeat Fisk (Tenn.) 88-66 in their first Association of Independent Institutions (A.I.I) conference matchup. Nash scored a game-high 22 points, while his teammate, senior forward Julian Camper, notched a double-double (21 points, 10 rebounds). CSUSM will now travel to Salt Lake City, Utah to take part in the Westminster Thanksgiving Classic, where they will play Montana Tech on Friday, Nov. 28, and host team No. 15 Westminster (Utah) on Saturday, Nov. 29.